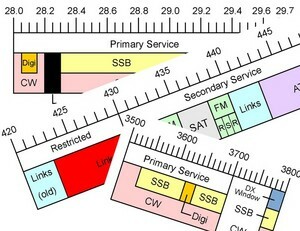 The WIA has commenced a review of the Australian Amateur Radio Bandplans. Bandplans are a way of trying to give everyone a fair share; an aim which becomes increasingly difficult as spectrum becomes crowded. For instance, in the case of 2-metre and 70cm repeaters on the east coast, the number of available frequencies is very limited and it has become necessary to reduce channel spacing or channel re-use distances, or both. Band planning is also complicated by the need to plan, as much as possible, for emerging technologies. That means that some spectrum must be kept in reserve for new applications, and some band segments may need to be reallocated to new uses as some operating modes decline in popularity. Some affiliated clubs and WIA members have already sent suggestions about how to improve the Bandplans, and work has already started on a revision of the 6-metre Bandplan following the closure of television channel 0, but we are very keen to hear from all users in order to identify the current Bandplan issues.